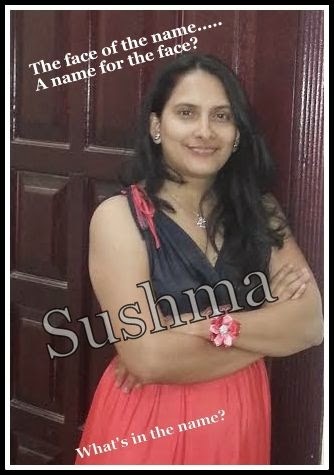 Sushma's Page: Name Game - It's All In A Name - From The "Shy Girl Of Manipal"
Name Game - It's All In A Name - From The "Shy Girl Of Manipal"
Fancy naming a new born after a popular Bollywood or Hollywood star? Please do so. What's in a name? Bang onto "What's not in a name?". Remember you might hit a jackpot sometime when bizarre airways offer concessions to selected popular Bollywood character names. Recently the Virgin Atlantic Airways that threw away exciting offers to "filmi named" people. Behold- now say what's in a name? Whether of much use or not, I did muse upon the options on, what if I was named after some "Simran- sanorita"; the popular "pooja beti" the Yash Chopra's Madhuri Dixit; Priya or the bubbly Rani Mukharjee as Tina in Kuch Kuch Hota Hai. Aargh, well I love my name. not the airlines! There was a time, my introduction would compulsorily include "shy girl from Manipal!". If that meant a coyish girl, please don't be duped at all. Yes, I did be a lot much pessimistic in communication and outspoken category. In parallel, there was the big mischief soul inside me that has attempted simpler tricks to horrendous college pranks. To the extent of ragging a senior graduate fellow in university. Absolutely remember mother often tell me the n number of choices they considered when a fifteen days old "ME" was named. "Sushma", with literal meaning being beauty, perhaps they saw beauty of life in me. I wasn't technically named after any ancestors. But existence of many "Suhmas" in that era, marked a trendy name. Identity apart, every single person to whom you mean calls you "a name". They symbolize affection. Hence for the past years I must have had numerous names from family, friends and so on. Either the nickname, sometimes a 2nd name, at times an abbreviation of full name. Sometimes a roller coaster of it like "Sushuuuum, suhumaaaa..so on". At times shortened, at times sweetened, at times tasty like "Sushi". The proper noun that I have accepted and adored. All through life as I was brought up almost caned to understand, the beauty was not in the physical appearance, and that perhaps inspired me to see the "beauty" in absolutely everything around me to every action of mine. Even in a few naughty teenage tricks I tried, I found a beauty called fun. If my little girl today calls me "hey your teeth are paint box" for the different enamel colour each has developed over the years, I don't mind. Find it creative. Big joys in small things. Those peppy nicknames that turn out to be relevant identity that ages later an college mate can not recognise you on facebook but marks that nick name as the verification code. Authorised for friendship, call it! If familiarity to Indian culture strikes to you all or not, we Indians, specially South Indian Brahmins do have a ritual of changing names after marriage. The first name too! With changing world, which is losing its acceptance, yet the tradition was fun. You adapt yourself to your in laws and also change your name. Identity challenged! "Only Love"- let me declare it so, the noun that identifies you, the name by which you are recognised . While there's a literal sense of "what's in a name", my love for my name is unique. It's the perfect love compatibility match. There is no "rename" option in real life for me. Apparently perceptions of name and identity have some perpetual thoughts beyond the "noun" factor. The identity tag that finds its best love match with the personality. Brought up in "Manipal", I love the place and the name. There's no rename option for it too! I would hate it. An exotic illustrations of the name game can be hilarious. How about the "bhagwan ke naam pe de do baba". Popular slogan meant for unfortunate beggars, with the mention of "in the name of God". Times when the names turn into those of Bollywood stars are heard of too. You see, it's all in the name! I was taken by surprise when my daughter at her age 5 had declared "Jui" is a childish name. She must change it as she grows up into some adult type! With occasional breaking burps in middle of a dinner I had to answer her, "adult type are not so popular"! Just the trend matters. She is now convinced as she reaches her teens. Take an instance if I had chosen to call my new born "Mukesh" "Aamir"! Or perhaps giving up to "adult types" changed her names to "Kiran (after Bedi)"' or "Kalpana (after Chawla)", what was the probability of the fun in matching the gravity in those names to your whims and choices? When a chord strikes between my name and "Sushma Swaraj" of Indian politics, I ....errr...let me sign off friends. It's Sushma from Manipal and that's how I love my identity tag to be fixed up forever. Your a gifted writer Sushma! Thanks for your post, and for your visit and comment. Yep...that trend thingy is so appealing. Exactly why I called it name game. It's really interesting to note name game for each person. Very well written.And ,of course you are a very nice girl. This is a blessing Sir. Thanks as always.